I love rugby, watching it, playing it, talking about it, I just can’t get enough. With the Rugby World Cup pool stages just about ending, I’ve been thinking about the brutality of the game and what that means for the bodies on the line, including my own. Players are fitter, stronger and bigger than ever before. This isn’t just at the elite men’s level. I’ve been playing for thirteen years now. What I’ve seen is that you are now more likely to see players at the gym in the mornings than in the pub in the evenings. That’s from all levels and genders. What does this mean? Well, a much higher injury count for one thing. Welsh fans enjoying the recent tournament may feel this, as perhaps we have suffered more than most from 'a popped this' or 'a broken that'. Winning no longer means simply playing better rugby than your opponents. It also means keeping your players fit enough to do the job, even with short turnaround times between encounters. So what can teams do about this? It starts with an observation that becomes an idea, and is then followed by about 4000 years of creativity and innovation. Wales are well known for their use of cryotechnology. It not only aids recovery from injury, but also allows players to train harder and for longer. Sam Warburton recovered from a knee injury to play, and win, the 2012 Grand Slam Final due, in part, to the recovery perhaps made possible from a cryosauna. Everyone knows that you put ice on your bumps and bruises. It reduces swelling and relieves a bit of pain by numbing the surface of your skin. But did you know that the first people to realise the benefits of cold on injuries were the Egyptians? Knowing the simple fact that the cold is an analgesic is one thing, but being able to apply and further that knowledge shows real inspiration. Just how did we get from putting ice on bumps to whole body cryotherapy? I wasn't surprised to find there are many patents relating to cryotherapy. English physician James Arnott is labelled ‘the father of modern cryosurgery’. He used his knowledge of salt lowering the freezing temperature of water to produce a solution far colder than before. He created his own equipment to treat patients with this method. His creation turned out to be a prize medal winning innovation at the Great Exhibition of London in 1851. But his creation had its limitations. With a lowest temperature of a chilly -24°C we needed to see a few more creative surges up field to hit truly cold temperatures. Witness phase after phase of scientific knowledge in the late 19th century contributing to advances in the field of liquefying gases. This meant huge strides in refrigeration potential that would eventually lead us to the 'evil sauna'. Our next leap of innovation takes us to Japan in the 1970s and studies into the treatment of arthritis. Dr Yamaguchi and his colleagues realised that the best way to treat inflammation was to chill the skin, and not the tissue beneath, to extremely cold temperatures extremely quickly. Rapid chilling of thermoreceptors in the skin (the parts of a nerve that detect changes in temperature) reported the best benefits. In case you’re interested, some studies have suggested that the reason for this response dates back to evolution of human beings during ice ages. The periods of cold followed by more temperate conditions encouraged reactions in the nervous system that possibly contributed to growth and recovery. But now we’ve gone a little away from rugby so let’s move to the Olympic rehabilitation centre in Spala, Poland. This is where cryotechnology as sports therapy has come into its own. All kinds of sports teams from all over the world visit the cryotherapy chambers. They hope to take advantage of the millennia of scientific knowledge that has culminated in a liquid nitrogen filled room. The Welsh team are so convinced by this therapy that they invested in their own unit for their training base. It remains to be seen if this will help us earn a coveted place in the final on Halloween. As for me and my team, I’m sure given the opportunity to speed up our injuries we'd jump at the chance. 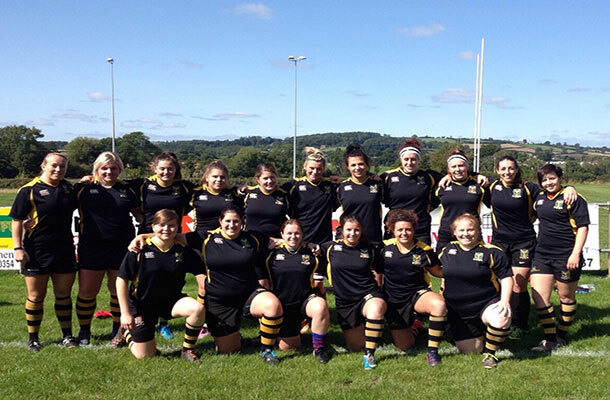 Me and the rest of the Llandaff North Ladies team. Wow! Very informative Intelligent writing. I really enjoyed reading this Blog and look forward to more! 24 degrees C is not cold! F? Thanks for highlighting! We've added the minus sign.